In a name...Joe Celso. 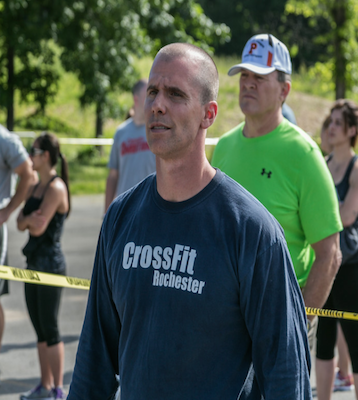 To start, Joe is the only Level 4 CrossFit Certified Coach in the region. His programming is known for being unique, rigorous, and results-focused. And nobody motivates people to exclaim, "Wow...I had no idea I could do that!" more often than Joe does. Come in and you'll be amazed at what you can do, too. Joe Celso grew up a “315er” with a passion for motocross and football. Having finished with football – while working on his undergrad at UB, he concluded the workouts in bodybuilding magazines really only made his chest bigger and did absolutely nothing to help him ride his dirt bike. It was at that point he began experimenting… creating and testing workouts to improve his own level of fitness. While he found success, he knew there “chinks in the armor.” In the spring of 2006, a former Marine suggested he look at CrossFit and upon reading the philosophy Joe KNEW he was on to something good. Unable to find anyone locally to help him learn the movements, Joe went to CrossFit Atlanta to learn from the man himself – CrossFit founder, Greg Glassman. ​Erin grew up in Massachusetts — back when the “three-sport athlete” was the norm — and captained her high school soccer, basketball and track teams. She attended Harvard University where she played basketball and captained the women’s track and field team. Her specialties were hurdles, high jump, and triple jump. (She also reluctantly ran the 1600-meter relay.) As a six-foot high jumper, she earned All-American honors and was also awarded the Radcliffe Prize as the outstanding female athlete of her class. Fast forward to real life: three kids, a career, husband, and life in Fairport, New York. Seeking fitness and competition she joined gyms, tried paddle tennis, golf, 5K road racing, horseback riding, bike riding… you get the idea. Nothing quite provided the variety, camaraderie or competitive atmosphere she sought. ​One workout at CrossFit Rochester changed all that. Erin joined in November 2008 and earned her CrossFit Level One Certification in August 2010. She was a member of the CrossFit Rochester team that competed at the Northeast Regionals of the 2011 CrossFit Games. Mike D has been a regular early am’er at CrossFit Rochester since 2010, after shuttling his then high school daughter, Bethany, to the gym for six months or so. The actual story of how he started is funny (and a bit pathetic), but you’ll have to ask him about it. Mike was a multi-sport athlete in high school and had a short stint on the football team during his time at the UofR. He played a lot of competitive basketball after graduating and throughout the next 20 years. His knees, however, were not up to continuing that lifestyle, and Mike was left without an exercise regimen and a reason to do it. After a few failed attempts at restarting in a “traditional” gym, and a newfound passion for officiating lacrosse, he followed his daughter to CFR. A sixty pound weight loss in the first six months in the gym was followed by opportunities to CrossFit all over the US and even in Korea, China and Taiwan. He was hooked. A coach throughout most of his adult life in a variety of youth and high school sports, Mike was drawn to helping others find success thru CrossFit, just like he had. After being a regular “sub” for Joe for a few years, Mike has taken a regular role on Wednesday nights and weekend mornings. The rest of the week you can find him in the gym daily at 6am, trying to survive and solving the world’s problems before and after WODs. ,A Brighton native, Jason has been a dedicated 5 am’er since Halloween of 2011. He earned his Level 1 coaching certification in January of 2015 and CrossFit kids certification in October 2017. Outside of the gym, Jason teaches Physical Education and coaches three sports (modified football, varsity bowling, and varsity baseball) in the Brighton Central School District. CrossFit has had a huge impact on Jason; so much so that he has incorporated it (and nutrition lessons) into his PE classes and off season workouts for his athletes. Jason has competed in several WODChester games and summer games competitions. You can find Jason teaching Wednesday mornings at 5am and sometimes on Sundays. Julie completed the 2006 Marine Corps Marathon, the 2008 Rock ‘n Roll Marathon and several half marathons. She has also coached soccer for The Pittsford Mustangs. Julie has a strong interest in diet and nutrition after being diagnosed with Celiac’s Disease in 2008. Julie has been at CrossFit Rochester since October 2008. 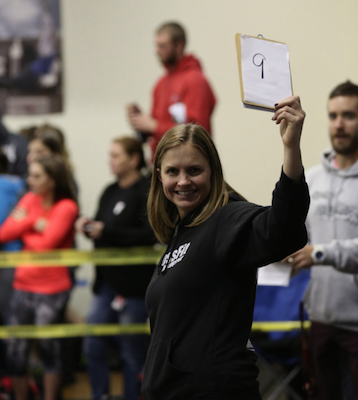 She received her CrossFit Level 1 Certification in August of 2010, CrossFit Endurance Certification in May 2011 and attended the Coaches Prep Course in August 2011. In 2012 she obtained her CrossFit Kids in May and attended the CrossFit Strongman Certification in June. ​Greece, NY native Chris Lenzi grew up playing various sports (football,baseball,hockey) but his passion for motocross opened a door for his career. He attended MCC where he earned his AAS in Mechanical Technology, and a BS in Mechanical Engineering Technology from RIT in 2009. Lenzi has a knack for pushing people to their limits – in a good way. Lenzi is a motivator. Chris started CrossFitting in 2007 as a way to stay in shape for motocross. Since that time he has made tremendous strides in strength, stamina and in overcoming racing related injuries. Always setting an example in terms of work ethic and intensity, Lenzi received his CrossFit Level 1 Certification in November of 2011 and attended the Strongman Certification in June 2012. James grew up as a sports loving kid in Jamestown, NY. Hockey was his first love and then he expanded to baseball, basketball, and tennis. After graduating from high school, he headed off to Clarkson University where he could play lots of intramural sports and eat lots of chicken wings. A couple of years after graduating from Clarkson and becoming sick of weighing around 300lbs, James changed his lifestyle and started working out on a regular basis. While following a variety of programs, James happened to find a website called CrossFit.com and he subscribed to the CrossFit Journal. He even did some WODs in his basement and at the gym. Then in the fall of 2012, James had a mid-life crisis. Some guys buy a sports car when that happens to them. James came to CrossFit Rochester. After being a three times a week person and a regular at 5am classes on Tuesdays and Thursdays, along with a sprinkling of Monday and Friday 5am classes and Saturday at 7am, James got his CrossFit Level 1 certificate in the summer of 2017. He followed that up with a Precision Nutrition Level 1 certification in the fall of 2017. If you have any nutrition questions, James is more than happy to help people out. He wants to pass on as much of the information that helped get his health in order and his weight down around 100lbs from his college graduation to others you want to get healthier. ​When James isn’t at the gym he is busy being a husband and father of three kids. He still loves hockey and both helps coach his son’s team and plays one night a week. During the summer, he is either helping coach his daughter’s soccer team or watching his son play baseball.